Buffalo Small-Cap Value Fund (BUFSX) has been part of my taxable investment portfolio since the beginning of 2002 when I started to invest in mutual funds. 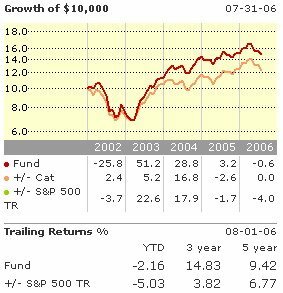 Since then, I have been dollar-cost-averaging $100 into this fund every month and the fund’s returns in the past has been very impressive: 51.2% in 2003 and 28.8% in 2004 according to Morningstar data. What I like about this fund is its value oriented investment approach and the diversification the fund offers. Also, in past performance is any indication, BUFSX was one of best performing small-cap fund out there. However, as the case for many small-cap funds, the fund is quite volatile. And in recent years, the fund has started to lag not only its peers, but also the benchmark since 2005, after it lost its one manager (one of the criteria when evaluating a mutual fund is looking at the fund manager’s tenure and the longer the better because if can serve as an indication of the manager’s tracking record). Meanwhile, the total assets ballooned to $1.6B due to the popularity of the fund, the size that becomes a burden for a small cap fund in finding quality companies to invest. On top of its size, the fund also has an expense ratio of 1.01%, which is quite normal for a small-cap fund, but is still quite high (generally, you would want to invest in funds that have ER below 1%). Now, BUFSX is the worst performer in my portfolio. I am a big fan of small-cap funds and have owned several small cap funds in the past. At the beginning of this year, I trimmed my holds and now only have two: BUFSX and CGMFX. If I want to dump BUFSX, I need to find a replacement small cap fund and that won’t be an easy job after small cap has outperformed large cap for more than five years.